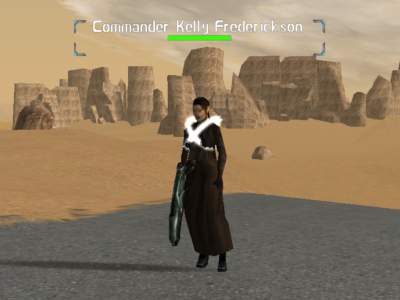 Kelly Frederickson is one of special encounters that spawn on random timer. Don't let her minute size fool you, this level 200 clanner is mother of 2 children and knows what is she fighting for. She's eager to help with directions and willing to share story about history of Rubi-Ka. Unfortunately she's usually sent back to reclaim too fast to actually tell anything. Regardless of your level, you need to bring team for this one if you desire her loot. Beside having a bit too much health points and high regen, there are usually quite a few campers there to greet her. spawns at 1740, 1095 in Tir County.